In 2006, if you wanted good wine, you got it from Rudy Kurniawan’s cellar. The twenty-something, who had charmed his way into the inner circles of critics and collectors, had made a name for himself as a wine connoisseur. That year, he and Acker Merral & Condit, a wine auction house, broke records when they sold over $35 million worth of his wine. A devotee of Burgundy, Kurniawan was said to have the “greatest cellar on Earth” and achieving infamy was natural. Unfortunately for Kurniawan, the attention drew doubt from Domaine Ponsot, an estate whose coveted Clos Saint-Denis Kurniawan claimed to be selling: though the labels looked authentic, the years weren’t. Kurniawan was consigning bottles from 1945, 1949, and 1966, almost four decades before the estate started producing it. If only these were physicians who prescribed Chardonnay as a cure-all. During the 18th century, scientific advancements led chemically-minded scientists to transform everyday items into wine. Apples became Champagne, sloe became Bordeaux, and some entrepreneurs would even use raisins (at least they stuck to the same type of fruit). European governments finally stepped in in the late 1800s and early 1900s to put an end to it. It was 1985, and Austrian wine producers wanted to make their wine sweeter after a rough grape-growing season. Naturally, the solution they settled on was antifreeze. This ingenuity was limited to a select number of bulk wine producers who were sending their wine to Germany, though tainted bottles made their way around the world. The impact was immediate: 36 million bottles (27 million litres) had to be destroyed by the German government, and exports fell from 45 litres a year to 4.4 million. Though no one got ill, it took 15 years for the industry to recover, but bottles are once again being exported at an exceptional quality. In recent years, China’s wine industry has boomed, and con artists haven’t missed out on a potential new market. French wine is (unsurprisingly) a favorite, but the Comité National des Conseillers du Commerce Extérieur de la France (CNCCEF) estimates that, in China, one out of every two bottles of French wine is fake. While some crooks have converted chicken farms into bottling stations, much of the blame lies with the importers, distributors, and sub-distributors, who have transformed it from crime to industry. By passing off local wines as French, they’re able to avoid high import duties and taxes and capitalize on an established brand. What they’ve really managed to do is damage French wine consumption: drinkers are migrating away as the threat of fraud lingers over each bottle. There’s a reason wine fraud is so common: unless you’re sampling old vintages regularly, it can be hard to tell what’s been over the hill and what’s (relatively) fresh from the vine. But when you’re paying over $300,000 a bottle, you want to make sure you’re getting the real deal. Nuances of appearance are often a giveaway for spotting fraudulent bottles: labels may be on paper that wouldn’t have been available during the period or may use incorrect font. Keep an eye on capsules, which may use the wrong color wax or foil instead of wax, and corks, which could have incorrect fonts or shading. Be wary of what sounds too good to be true, and stick to shopping at grocery stores, wine stores, and auction houses you trust. The devotion to wine, and people’s willingness to pay hundreds of thousands for it, make fraud another facet of the industry. At least frugal winos can rejoice: if you’re buying a $10 bottle instead of a $1,000 one, you never have to worry about someone trying to rip you off. How about Rodenstock, one of the greatest fraudsters. 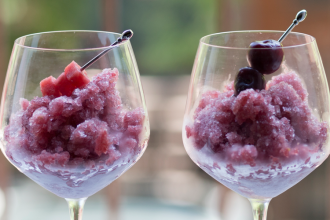 Wine Soaked Dishes: Watermelon & Pinot Granitas!